Hi Friends! My name is Tina Weller, aka “The Serene Stamper“, and Frenchie and I have teamed up to bring you a new service that we’re calling “Passport Pals”! We are both so excited about this new venture together and we hope you will be too! I am thrilled to partner with France Martin (“Frenchie”) – a fellow Canadian (from New Brunswick) who has been living in the US for the last 22 years. Together we’ll be able to provide the best customer service to you, no matter which side of the border you live on! I signed up as a demonstrator (directly to the company) in Vancouver, British Columbia, in 2002, when Stampin’ Up! first came to Canada. Previously I had used a mix of products from other companies to create my cards and scrapbooks – but none could hold a candle to Stampin’ Up! once I had seen what they had to offer! For years I just took advantage of the demonstrator discount, perks and benefits to support my stamping addiction hobby – but now I work my Stampin’ Up! business full time. Originally from Comox, on Vancouver Island, BC, I was living in Vancouver when I met my husband, Russell, who came for a visit from England and never went back! In 2007 we decided to move across the country to a rural town in New Brunswick on the East Coast. We decided to start a life together in a lovely century old farm house we found while touring the Maritime Provinces. Russell has family roots in New Brunswick and mine are in Nova Scotia. Exploring these roots was the main reason for our relocation. Our kids are the furry kind – one kitty and two hounds – and we love them to bits! I found Stampin’ Up! a great way to meet people in our new area. I booked as many parties and workshops as I could and it really helped me become part of the community, as well as getting to find my way around! In the past three years that I’ve been working my Stampin’ Up! business full time, I’ve earned every incentive trip (including the upcoming Western Caribbean Cruise!) and this year I was honoured to be invited to the prestigious Founder’s Circle Retreat. This retreat is for Stampin’ Up!’s top 20 demonstrators in Canada and the top 100 in the US and it was absolutely amazing! It’s obvious that I’m passionate about Stampin’ Up! – both the products and the company – and I’d have to say, I think I was born to be a demonstrator. I love it! Canadian customers can shop for Stampin’ UP! Products through my online store 24/7 by clicking HERE. To view my video for this card and my “Inside-Out” Embossing Technique click HERE. 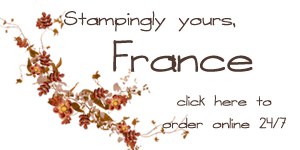 No matter which side of the border you live on, together Frenchie and I can accommodate you with your Stampin’ Up! orders and provide you with the BEST customer service possible! If you have any questions please don’t hesitate to contact Frenchie or myself. Stampin’ Up! policy is that we can only place customer orders within our own countries, so this is our way to support YOU the best way we can, and we are truly honoured to be your demonstrators! Fenchie is my blog guest today so you can CLICK HERE to see the pretty Thanksgiving card she made with the “Truly Grateful” stamp set! Congratulations! What a great idea! What a great idea to team up like this! Loved the video and the very cool technique. Thanks!